On Saturday, September 15, Ben Salzman and I presented the world premiere of Selected Galaxies: Spirals at the Kyma International Sound Symposium 2012 in St. Cloud, Minnesota. On June 2, 2012, the Crossroads District Choir presented the premiere performance of "It's a Good Day," an anthem commissioned by the Upper New York Annual Conference of the United Methodist Church for the Service of Commissioning, Reception, and Ordination at its 2012 annual conference in Syracuse. And on May 31, 2012, the Crossroads District Choir presented the premiere performance of "Here We Are, Lord," an anthem commissioned by the Upper New York Annual Conference of the United Methodist Church for the opening worship service at its annual conference in Syracuse. M17 continues to be presented as part of a permanent installation, Planet Explorer, at the Adler Planetarium in Chicago, beginning March 26, 2010. On Sunday, October 16, 2011, the combined choirs of the Clinton United Methodist Church and the First United Methodist Church of Rome, NY performed my choral pieces In the Stillness and Be Thou My Vision in a fundraising concert for Habitat for Humanity at 3 p.m. at the First United Methodist Church in Rome, NY. On Friday, October 7, 2011, I presented a talk entitled "Water Music, from Mars" at the 62nd International Astronautical Conference in Capetown, South Africa. Included in the talk were excerpts from my new Ares Vallis video. NGC 6357, with video by Miranda Raimondi, was presented at the Understanding VISUAL Music 2011 conference on Friday, August 26, 2011 in the D.B. Clarke Theatre at Concordia University in Montreal. NGC 6357, with video by Miranda Raimondi, was presented as part of the BYTE Gallery Summer 2011 International Exhibition during the summer of 2011 at Transylvania University in Lexington, KY.
NGC 6357 was presented on the Electroacoustic Music Macomb concert on Tuesday, November 16, 2010 in the College of Fine Arts and Communication (COFAC) Recital Hall at Western Illinois University in Macomb, IL. A few of the Selected Nebulae, with videos by Miranda Raimondi, were presented at the Central Conservatory in Beijing on October 27, 2010 as part of the Musicacoustica 2010 festival. Fanfare for the Best Man, for organ, was premiered at the First Presbyterian Church of Utica, New York on October 2, 2010. The piece was commissioned by the church in honor of Stephen Best for his forty years of outstanding service as organist and choir director. The composer performed the work on the church's Cassavant organ. A few of the Selected Nebulae, with videos by Miranda Raimondi, were presented as part of the Kyma International Sound Symposium in Vienna on Sunday, September 26, 2010. Ares Vallis, with video by Lauren Koss, was presented at the Mars Society convention in Dayton, OH on August 5-8, 2010. The Selected Nebulae, with videos by Miranda Raimondi, were presented as part of the Syracuse Society for New Music's Cazenovia Counterpoint series at St. Peter's Episcopal Church in Cazenovia, NY on Saturday, July 24, 2010. NGC 1999: Spooky Action at a Distance with video by Miranda Raimondi, was presented at the SCOPE festival in Basel from June 15-19 as part of an installation entitled "The Light at the End of the Tunnel," which celebrated the Large Hadron Collider that recently became operational at CERN Labs in Geneva. Adrift was presented as part of the 60x60 Vermilion Mix at the Electronic Studio of th Technischen Universität Berlin on June 10, 2010. Adrift was presented as part of the 60x60 Vermilion Mix at the ICMC 2010 from June 1-5, 2010 in New York City and Stony Brook, NY. Contemporary Art in Chicago on April 27th, 2010. The Selected Nebulae, with videos by Miranda Raimondi, was presented as part of the upcoming exhibition, "Look Up," at the Emerson Gallery at Hamilton College from January 18 - April 18, 2010. NGC 6357 was presented at the 2010 National Conference of the Society for Electroacoustic Music in the United States on Saturday, April 10, 2010 at St. Cloud State University, St. Cloud, Minnesota. M45, with video by Miranda Raimondi, was presented at the New York City Electroacoustic Music Festival, on Saturday morning, March 27, 2010, at 11:00 a.m. at the CUNY Graduate Center, in New York City. NGC 1999, with video by Miranda Raimondi, was presented at the MusicBYTES festival at Lewis University, near Chicago, at 2:00 p.m. on Friday, October 30, 2009. NGC 1999, with video by Miranda Raimondi, was presented at the Redhouse Arts Center on Friday evening, September 25, 2009 at 7 p.m. as part of the ((audience)) Experimental Film Festival. browse to Amazon.com or Barnes & Noble. drop by and place an order at any store that sells recorded music. 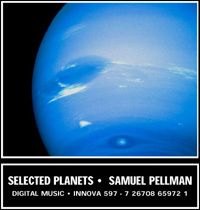 visit the Selected Planets page at the iTunes Store to purchase tracks!